This is what I did. 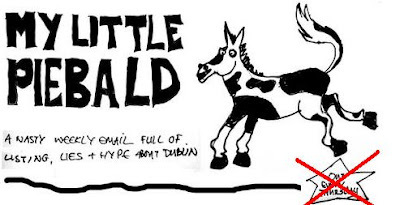 : No more My Little Piebald newsletter? No more My Little Piebald newsletter? Ah boo. Just as it was getting interesting (i.e. less personal), another satirical look at Ireland is put to rest. Due to one of our editors dying, and another being called up to play for the Lions in South Africa, MLP will be appearing in a different format from now on. Starting on May 1, My Little Piebald will publish a monthly edition on our website. The format will be slightly different but we will maintain the low standards and unfinished feel that has been perfected in the weekly mailout. In the meantime, we are leaving you with a selection of the worst articles which have appeared in My Little Piebald since it started last May. We will let you know by email when there is new content available on the site. I found it funny that the link to their worst articles didn't work when I got this due to a mistake in the URL. That's just my sense of humour though. Who will rise to take their place? Is it sad that this online/gossip/satire junkie has never heard of this?